Lotion Scrubs can be deceptively easy to prepare, if you are a classic under-achiever – whose idea of a proper Lotion Scrub is to tip a bottle of lotion into a nice exfoliant and call it a day. Yet, ever one’s to aspire much higher, our fabulous Lotion Scrubs draw upon our owner’s expertise for putting her own chic bent on the ubiquitous – until she has appositely made it her own! Thus said, our natural Lotion Scrub is distinctively created with crushed rice, Dead Sea Salts, organic Cane Sugar, organic Grits and our very own Shea Lotion to render an elegant and sprightly scrub that lends itself well to your sacred home spa ritual. And, as its name suggests -- our Lotion Scrub aptly exfoliates your skin, whilst morphing into a fabulous lotion to raise the bar of your ordinary home spa experience! Our Peppermint Lotion Scrub weds our unsurpassed lotion recipe with organic sugar and ribbons of sweet Peppermint Essential Oil. This is a calming body scrub that soothes the senses, whilst leaving the skin baby soft. A gratis 9 oz. Shower Wash is included. Our Lemongrass Lotion Scrub brings organic Lemongrass and Lemongrass Essential Oil together with our signature Lotion Scrub recipe for a robust, yet equally soothing body treatment. A gratis 9 oz. Shower Wash is included. Our Ginger Lotion Scrub reigns as quintessential favorite. Here herbaceous Ginger blankets our signature Lotion Scrub, while a splash of Ginseng adds a sprightly finish. This scrub is perfection! A gratis 9 oz. Shower Wash is included. 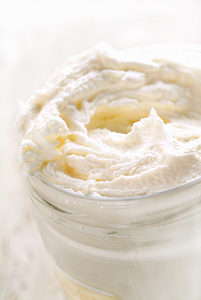 Our Marshmallow Lotion Scrub is not to be confused with the sticky Marshmallows that you get at your grocers. Indeed not! Our Marshmallow Scrub is fashioned from pure Marshmallow Root and sweet sugar cane whose gorgeous offspring is this organically just, yet completely addictive scrub that feeds your sweet tooth, naturally! In a word, it is: SUPERB! A gratis 9 oz. Shower Wash is included. Our Vanilla Lotion Scrub is the ideal goodie for greenie's who love a Vanilla body treatment, with a kiss of panache. Here, our signature Lotion Recipe is imbued with Vanilla Essential Oil and Vanilla Absolute, plus a kick of Rum to sweeten the deal. A gratis 9 oz. Shower Wash is included.